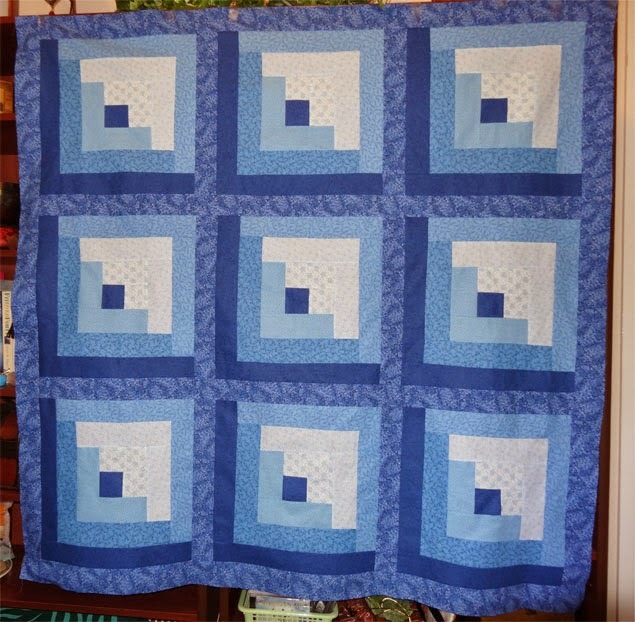 Quilt 30: Oh, Baby... DONE! Now I'll tell you what I learned on this one (and about the mistake). Look closely at the photo above. 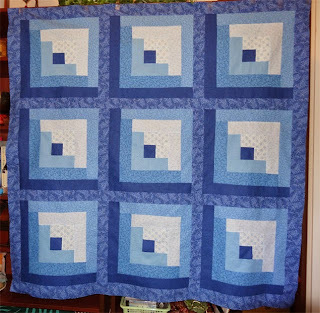 The border at the bottom is blue, then a yellow one above it and... above that... do you see the line in the stitching? It looks a bit like a fold. What caused that? 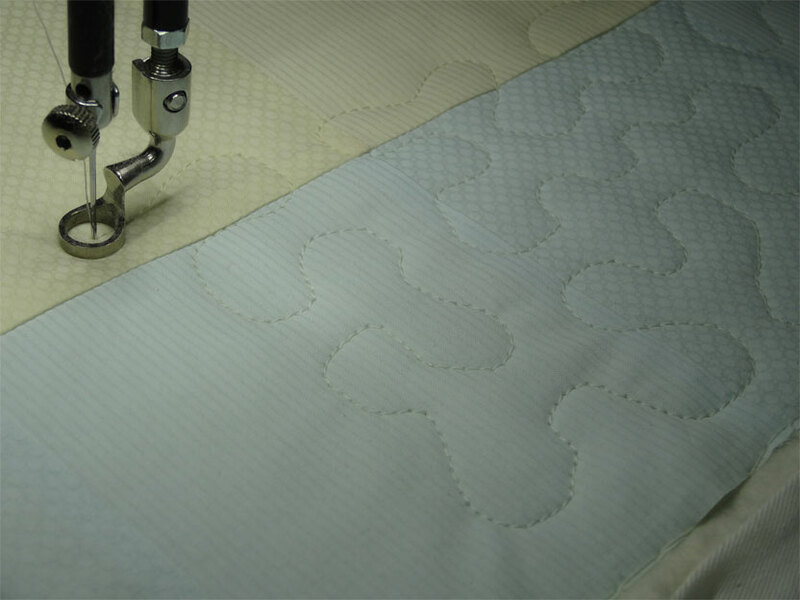 It's caused by having a space between two lines of "end-to-end" stippling quilting which is larger than the other spaces. Ugh. I've not figured out how to advance the quilt (with groovy boards). 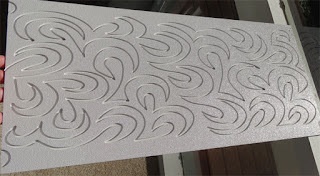 The groovy board gives me 2 lines of end-to-end stippling. But then I have to advance the quilt and reposition to get the 3rd and 4th lines of stippling. And I haven't figured out how to get it positioned perfectly, so there's always a little more or a little less spacing between rows 2 and 3 than there is between 1 and 2. 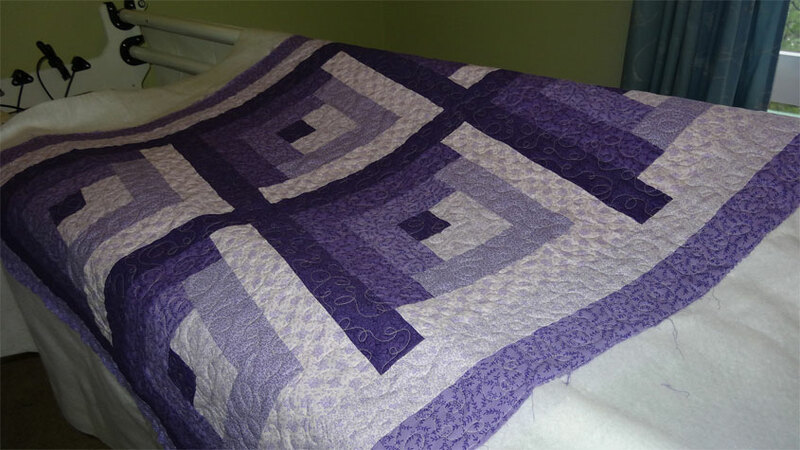 So what I've learned on this quilt is that it's better to have a slightly smaller gap than a slightly larger one. I found that if my spacing was smaller, that tell-tale fold line just didn't appear. 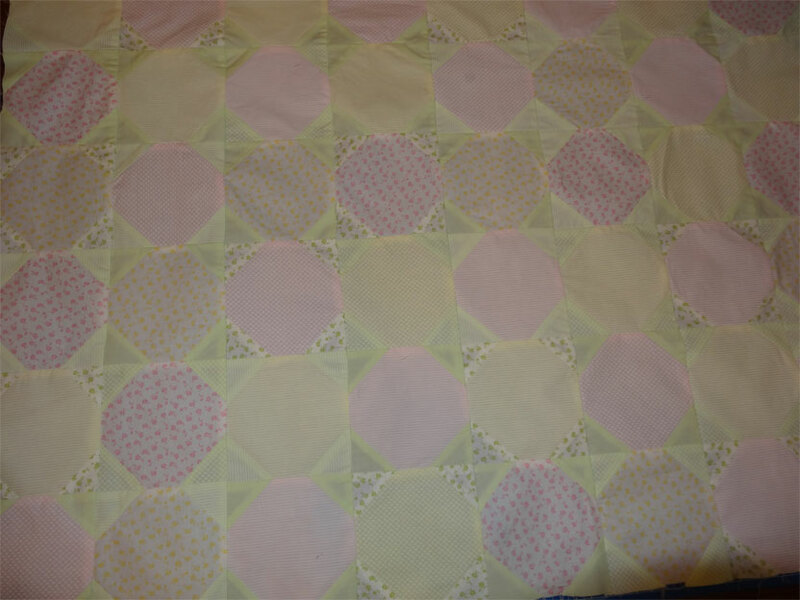 Here (above) is the backing - a pastel lime stripe. Very fresh and although it doesn't exactly match the greens on the top, it's not close to any of those greens, so it fools your eye. You THINK it matches. 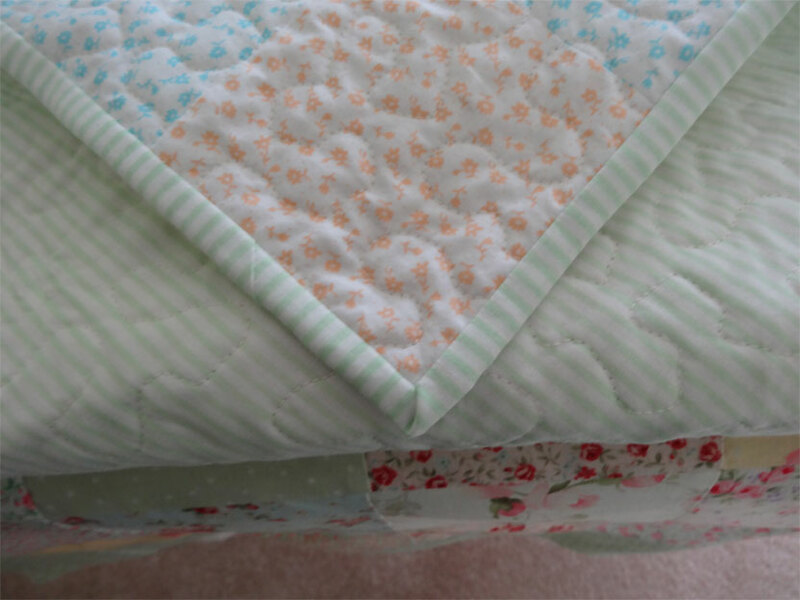 And here (above) is a closeup of the binding, done with the same fabric as the backing. It works beautifully. So this one is finished and I gave it to Kay when I saw her last Monday. She's delighted with it and I'm delighted that she likes it. "Slow down, you're movin' too fast..."
Quilting with a longarm is loads of fun, but it's a lot more challenging than I thought it would be. I've played around with free-motion quilting and have had some success, but, oh my it's not easy. I'm finding that when I do free-motion, my stitches are a bit too close together, causing the quilt to be a bit stiff. I'll have to work on that. 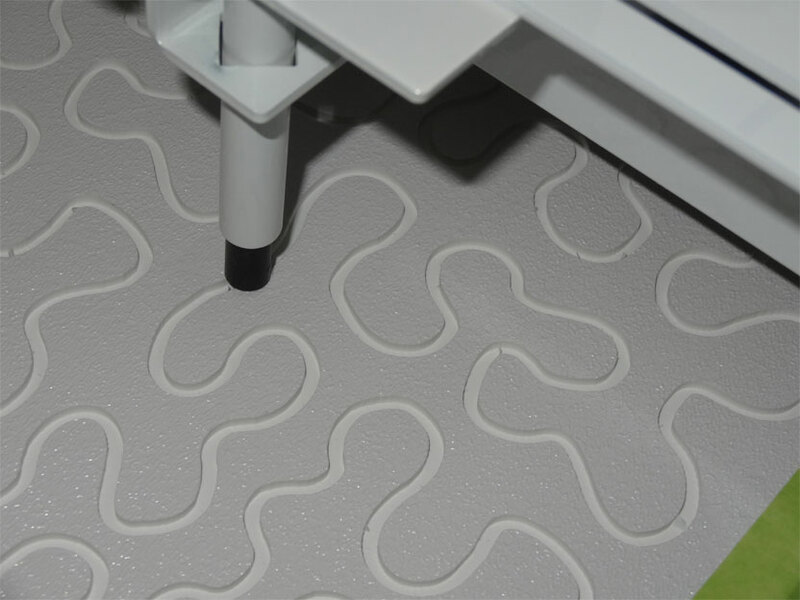 But there's help for awkward stitchers like me: Groovy Boards! 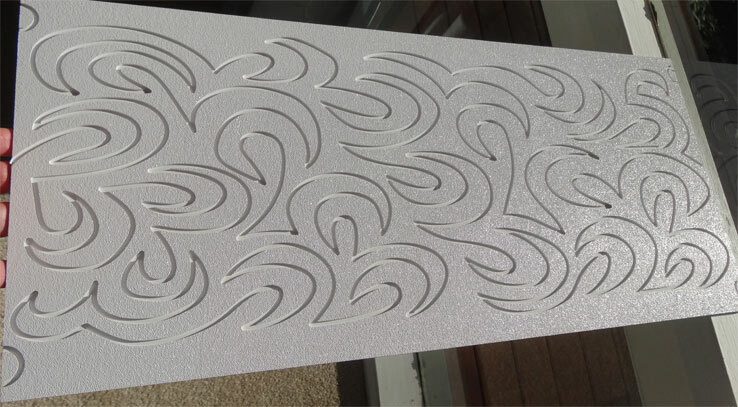 Groovy board with "Baptist Fan" pattern. 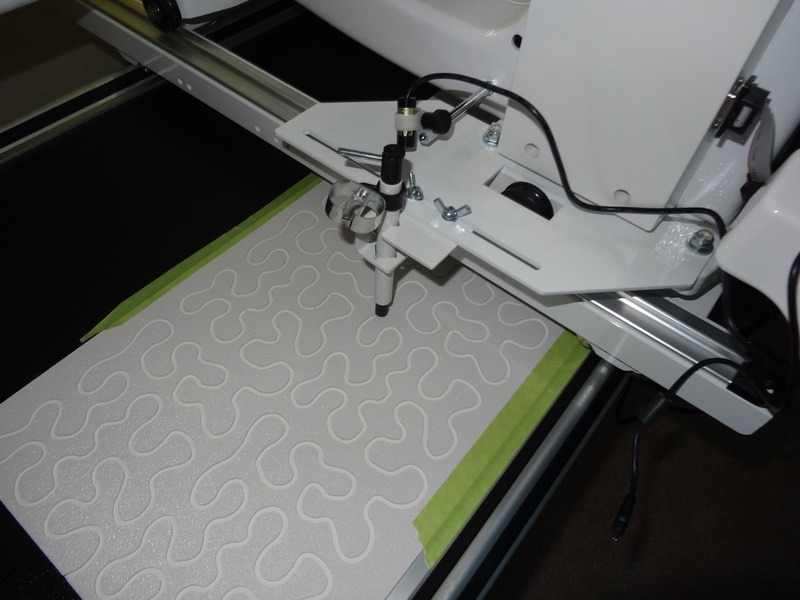 The pattern on this one is called "Blustery Breeze"
They work by providing a pattern channel which you follow with a "stylus" attached to the back of the machine. Here's a photo of the stylus on my machine. You just drop one end of the stylus into the groove and then guide the machine by following the groove. The pattern on the above board is "Simply Stipple". The stylus remains tightly held to the side of the machine. 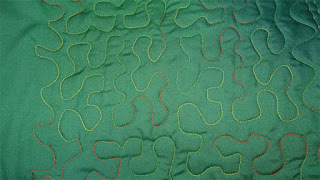 And below is what the stitching looks like in the quilt, taken at the same point as the photo above. exactly replicated in the stitching. The boards lock together end-to-end. 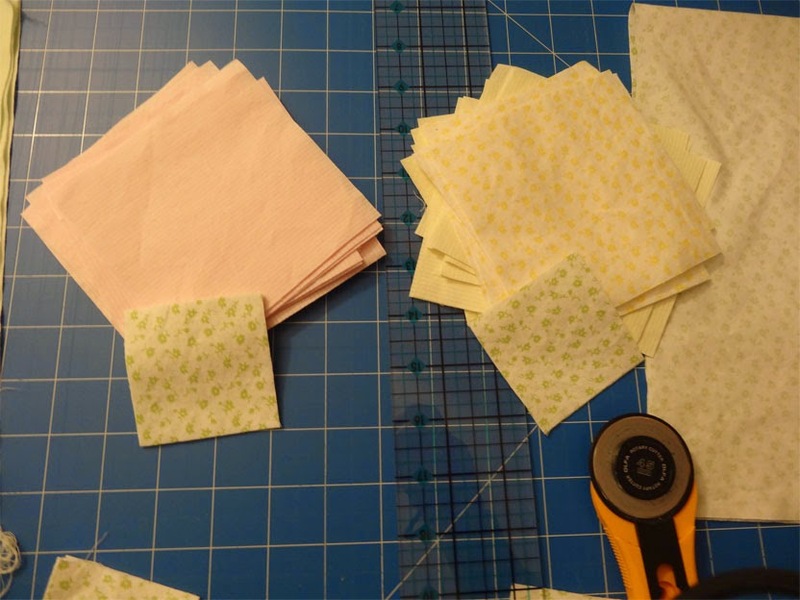 You buy them separately, but Handi-Quilter recommends getting at least two so that you don't have to stop and reposition when you reach the end. I opted to get 3 of each design - which gives me 6 feet. 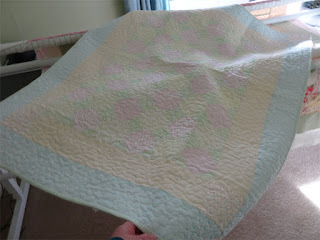 It was a bit expensive (the boards aren't cheap by anyone's reckoning) but now that I've done a couple of quilts with them, I'm really glad I did that. It makes a huge difference to be able to go from one edge to the other without stopping. Results? Well, I just finished a 50"x50" baby quilt with the board you see in these photos - and it took me 2 hours and 15 minutes. That's FAST!!!! And as I go along, I'm getting faster. There's a bit of a learning curve here. One of the things I've found is that the grooves are wider than the stylus point. That bit of "play" is a bit problematic, as giggling from side to side in the groove interrupts the smooth flow of the stitching. Gradually I'm learning to hug one side or the other of the groove as I go along. With the "Simply Stipple" pattern, it's not too noticeable, but those smooth lines in "Baptist Fan" will look horrible if I slip and end up with out-of-line stitches. I'm finding it very difficult it is to advance the quilt and keep the spacing between the rows even. It's harder than you think. But, again, with the stippling board, the variations aren't horribly obvious. Clearly "Baptist Fan" will be more challenging. I've had the thread break twice in mid-stream. Oh my - what a pain to reload and get back into the correct position. I've had the bobbin run out on me a few times, too - and again, not fun to reload and reposition. But I'm getting much better at estimating how far I can go on a single bobbin. So, with a nod to Simon and Garfunkel - I'm lookin' for fun and feelin groovy! 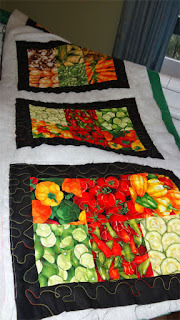 I decided that the 6 placemats would make a good 3rd "longarm" project - as with the first two, I like what I've put together but am not going to fall apart if the projects don't turn out. There are plenty of batting off-cuts in my UFO closet, so I grabbed a couple and hand-basted them together to give me enough to lay the tops on - and rummaged around to find some very cheap green cotton (which I decided I didn't like after buying it) for the backing. 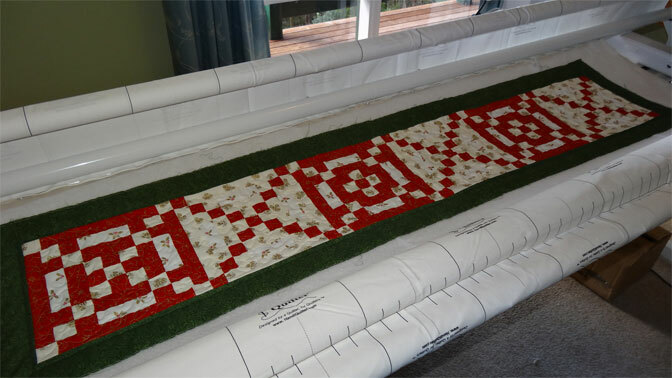 I'm not spending heaps of money on this project - and even the tops are made of leftover charm squares from another project. And here they are - all done. All I did was mount the backing (as with all longarm projects), float the batting and then floated the 6 placemat tops. It's not stretched out of shape, as it appears to be in the photo. The photo (above) shows the details. 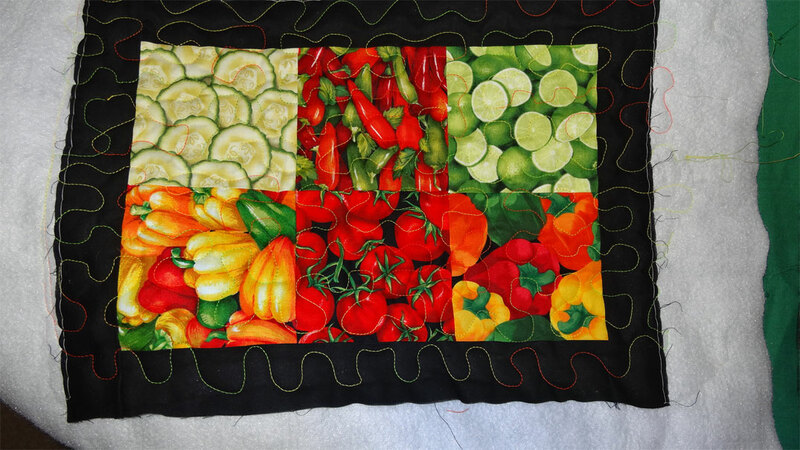 I opted to use varigated thread on this project - the thread is orange/yellow/green. It turned out pretty well. I'm quite pleased with how these have come together. And I'm feeling more confident about my skills with the longarm. 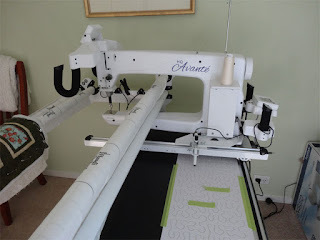 Time to select a "for real" project for the longarm. I've certainly got plenty of candidates. Back in 2012, I decided to get a subscription to a quilting magazine. The one I selected happened to have a "new subscribers" deal - offering a package of fat quarters for free. 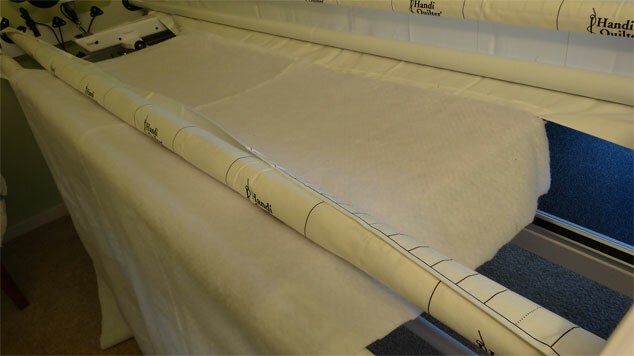 6 meters of fat quarters, no less!!! Uh huh. 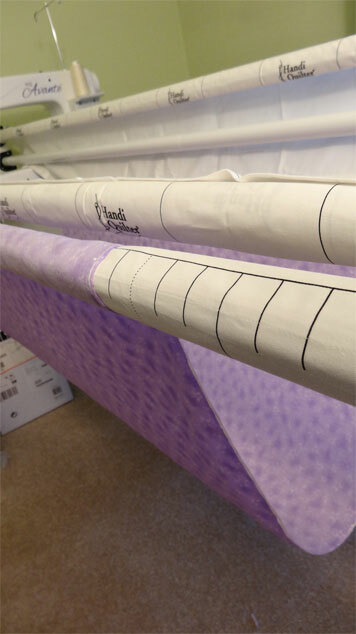 Well - the much anticipated 6 meters arrived and it was.... all... pastel baby prints. No.. not just pastel. Incredibly pastel - pale, pale fabrics. So pale I can't get a decent photo. It's been sitting in my UFO closet since then. 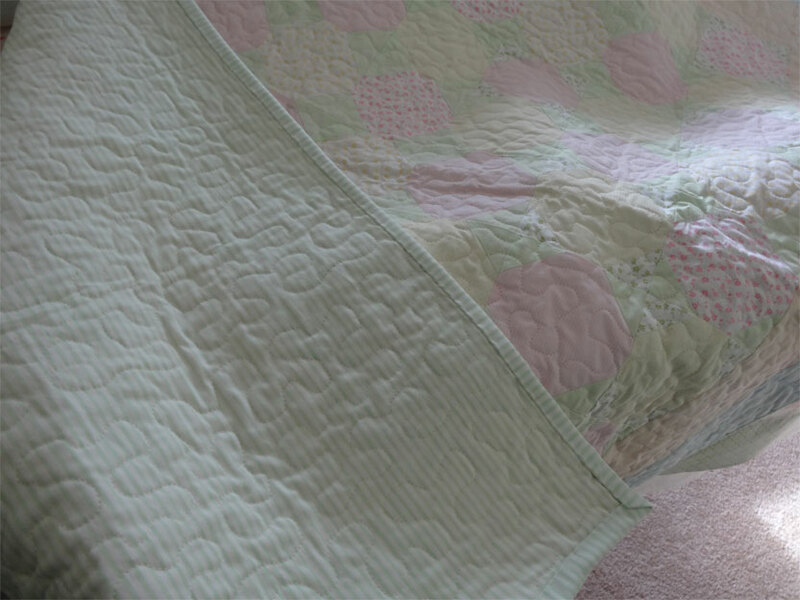 I didn't know anybody at the time who'd want a quilt made with prints like this, so I left it. Then friend "Kay" announced she's about to become a grandmother for the first time. Kay is so excited that, well, it's a pleasure to see her so happy. 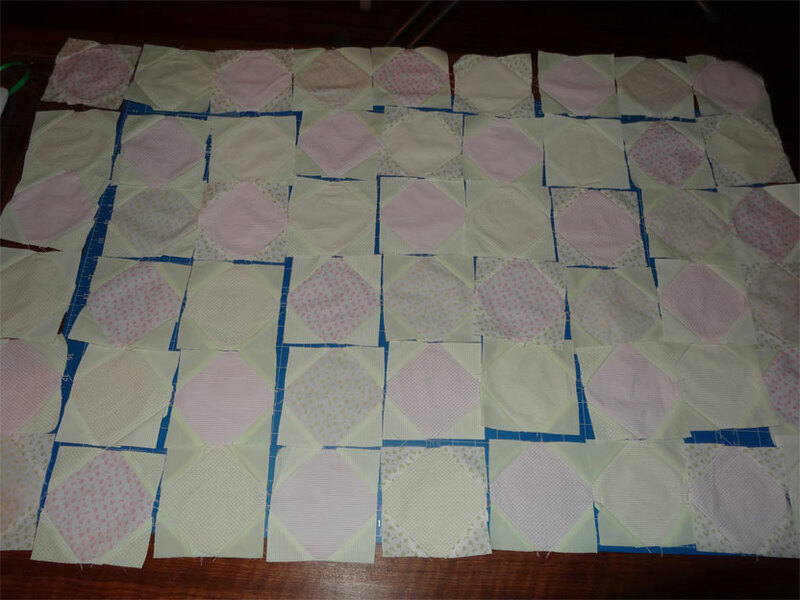 And with my longarm coming, I quickly remembered those prints and decided I should make a baby quilt for what we now know will be a lovely granddaughter. The prints are actually pretty - tiny petite patterns - but so very pale I can't get a decent photo. The fabric is very soft, smooth. After washing it and getting the sizing out, I LOVE the way it feels. Well, for totally free fabric, not bad! The fly in the ointment is the fact that this fabric is almost impossible to iron out flat. You look at it and it forms wrinkles before your horrified gaze. 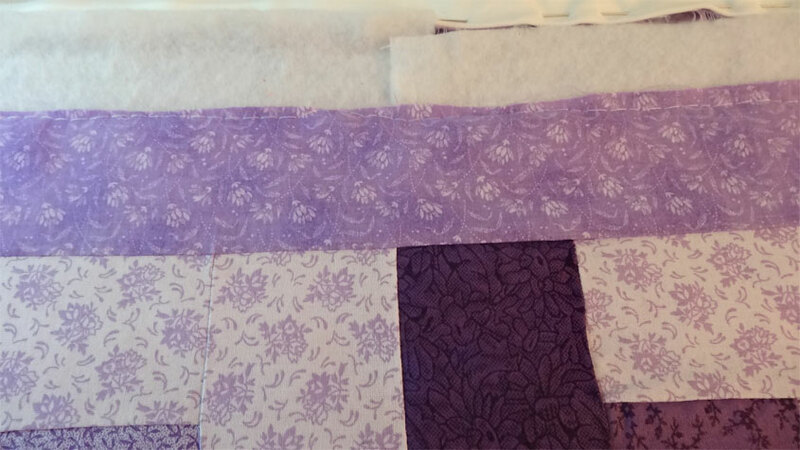 I almost threw the fabric out - but then realized that if the quilting done on this project is very dense, it might not matter. 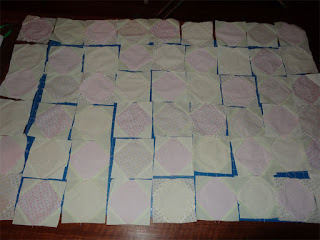 The density of the stitches should mask the wrinkly fabric, especially if the blocks aren't too large. So OK... away we go. 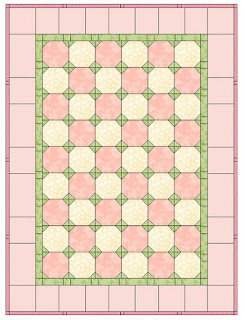 Pink and yellow blocks - "snowball" blocks with minty green corners. As I assembled the blocks - oh heavens.. this fabric gave me fits. It's so very pale that it was way too easy to accidentally flip the pieces and sew right sides to wrong sides. My seam ripper got a workout. AND - the fabric is somewhat unforgiving; ripped out seams left indelible holes. EEK! I went to my favorite fabric shop in search of a print to use as a border and found exactly NOTHING that matches the shades in this fabric. (Hear the silent scream?) I could border it with white, of course, but that just doesn't appeal. After assembling the top, I headed back to the quilting shop and found a soft pastel lime-green strip which will serve well for the backing and binding. But (oh heavens... am I under some kind of curse?) after I got home realized I might not have bought enough of it. Back on May 10, I posted a list of projects I'd started (and sometimes finished). 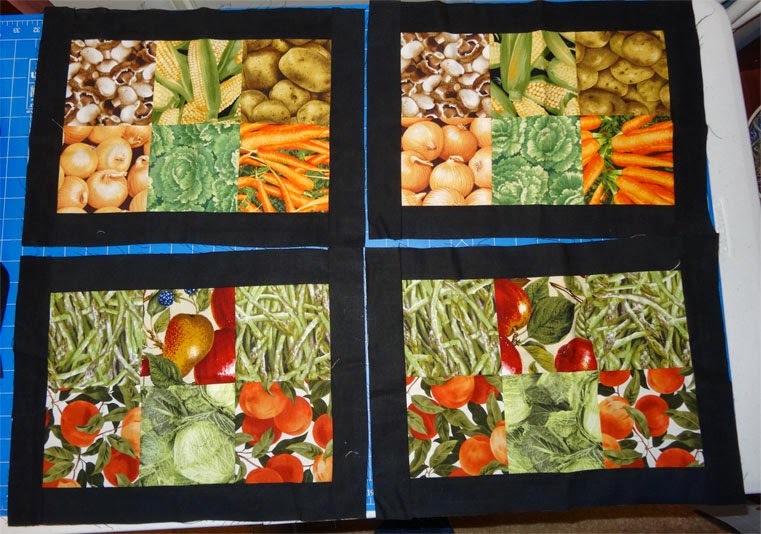 One of those was placemats made with the leftovers from a "throw" made up of fruit-and-veggie charm squares I bought while visiting my cousin in Florida. 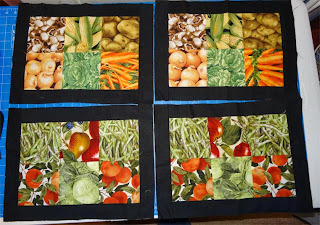 In that post, I showed the arrangement of the squares, but hadn't actually finished the tops. And this pair, much brighter, go together. 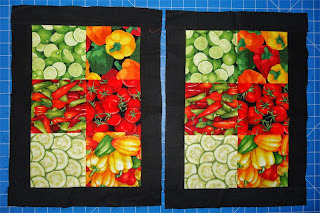 I want to machine quilt these on the longarm. Hm.. not sure how I'm going to accomplish that, as they are separate pieces, small bits. Next time I do placemats, I'll think about this problem and certainly come up with something better from the longarm perspective - but folks, I never dreamed when I put these together I'd actually HAVE a longarm. Anyway... here they are. I think the black edging works well, don't you?!?! 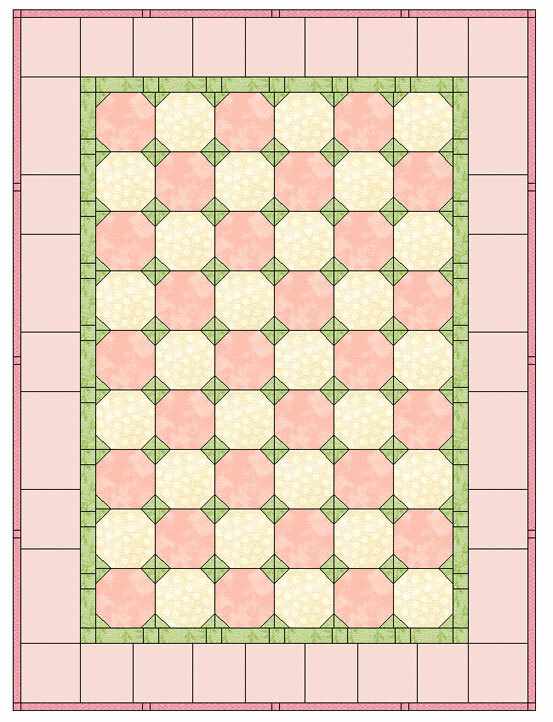 Quilt 27 was put together a while back and I mentioned it in a post last month. 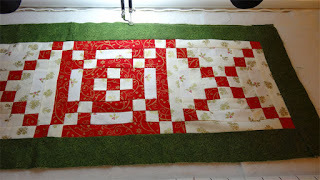 I like it, but felt it would make a good 2nd project on the longarm - if I messed it up, well, it wouldn't be the end of the world. 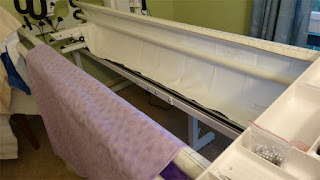 I've got a number of table runners I've started working on, so I needed to work out how to handle a smallish project on the longarm. This one is ideal. I'm using scraps of plain muslin for the backing and scrap batting, too. Not much expense involved in this. In both the photos here (above and below), I'm "floating" the top on the batting (which has already been basted to the backing to secure it. The edge border on this quilt is a bit problematic. The dark green fabric is a cheap calico, and it's stretching a bit, so as I baste the top down, I'm having to work the ease in to avoid bunching up. I think this is going to be something I'll get a lot of practice at - even with better calico. Done! The photo above shows the whole thing. It didn't take long at all to do. The biggest challengewas dealing with the ease on the borders. 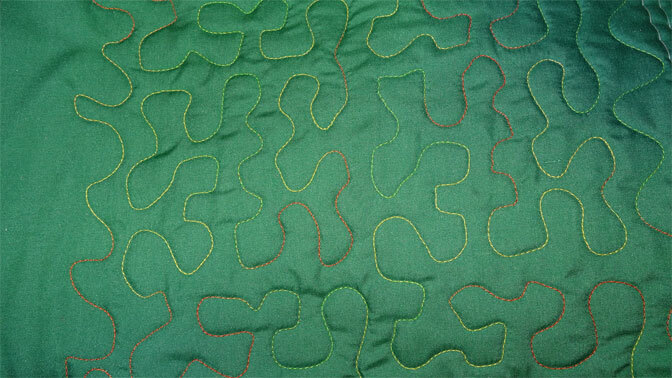 And here (above) is a closeup of the stitching. I ran a straight line around the border using dark green thread, then switched to cream for the center - and there did "loop-d-loop" freemotion, as I did the purple quilt I used as my first project. 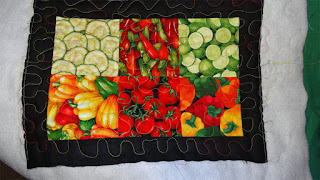 At first I thought I'd stitch around the squares, but quickly found that is really not easy to do. 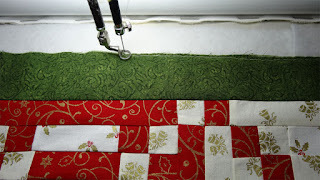 Controlling the longarm is still a little difficult for me. I'm wondering if I need to get some kind of rulers or guides to help me do smooth straight or diagonal stitches. So there we go - Quilt 27 ready for binding! At about the same time as my new longarm system arrived, we had some trouble with telephone/internet service at our home. I cannot explain why, but Telstra, our service provider, took 5 weeks to fix it. Well... the long(arm) and the short(arm) of the story is that, because hubby MUST have internet access for business purposes, we had to relocate as we awaited the fix. It was a long 5 weeks, let me tell you. But finally service was restored, and I've begun waltzing with "Matilda" (my name for the long arm machine). Oh my... big learning curve. I prepared a few "sacrificial" projects (ie: things that I wouldn't curl up and die over if they didn't turn out), and have been playing. 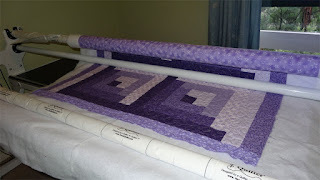 The first one to go was the smallish purple log-cabin I mentioned in this post: . It's made up of very cheap jelly-roll fabric from Spotlight (which I got at clearance prices). 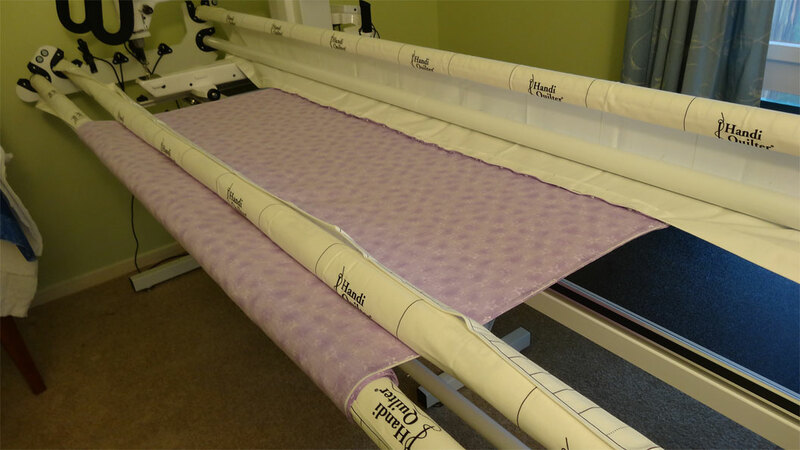 First, I placed the backing fabric on the machine, right side down. 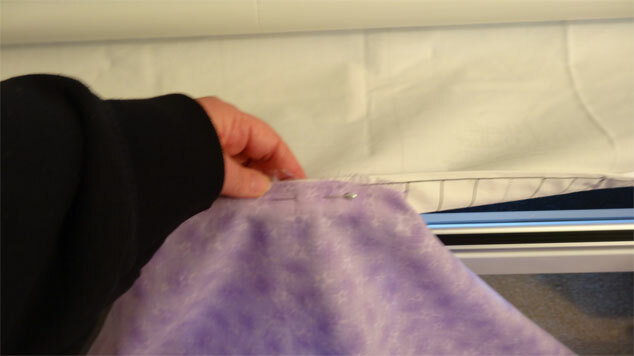 Now I pin the backing to the "leader cloth" (which in the photo above is hanging down from the upper most support bar). 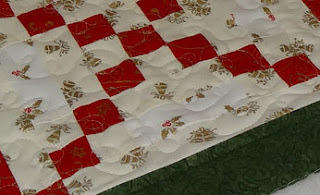 Then we "float" the quilt top over the batting - and stitch it all together with a straight line, working hard to stay within the 1/4" seam allowance. 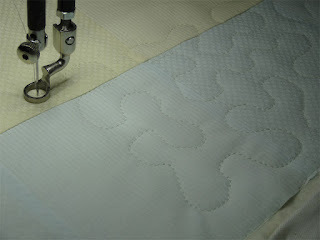 Once I've anchored the top of the quilt by basting through the top/batting/backing on one end, I baste the sides to secure them (topic for another post, I think). And away we go. 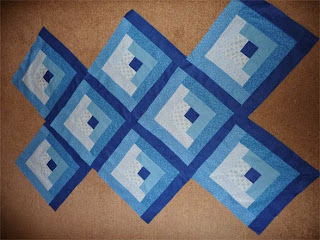 I practiced quite a bit to get my free motion "swirlies" right - but if you doubleclick the image below, I think you'll agree I did OK.
And here we are - just bout 2.5 hours later - the entire project is quilted. Not terribly impressive, but remember this is my FIRST ATTEMPT, and I am very pleased. It would have taken many hours to accomplish the same thing by hand. Off the frame and ready to bind! And much thanks to faithful friend Jen - who email'd me to remind me I'd not updated my blog this week as I'm supposed to. 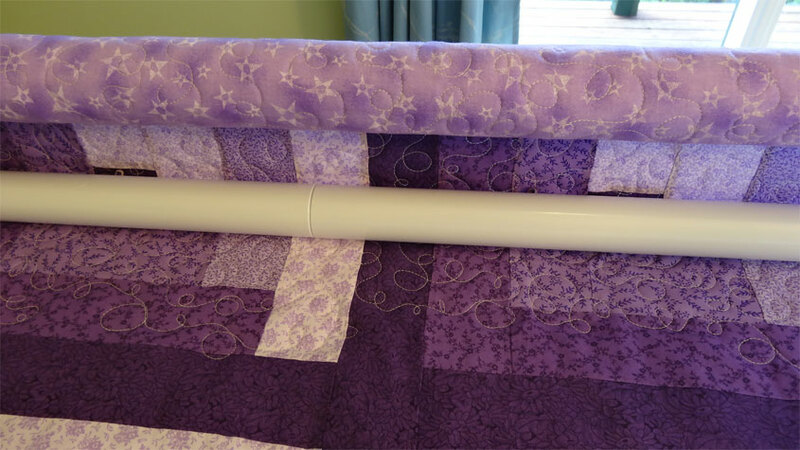 Here's another of the $5.00 jellyroll quilts. I started out thinking I'd do an on-point design like below - but quickly decided against that. I like on-point designs, but this one was going to look kind-of creepy unless I did something really special with the triangular edge blocks. Well... I just lost interest in it. So here we are - the blocks finally assembled and joined with a blue lattice. Kind of a giant "9 patch log cabin" thingo. The photo above does a better job of representing the colours - so the one below looks a little washed out. It's just what the camera was doing at the time. 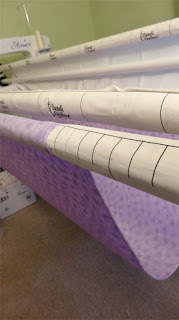 As the purple jelly roll I mentioned not long ago, this isn't a serious quilting project, more of a practice one for the longarm. Only about $40 of material, so although it's not a "freebee", I haven't invested heavily in time or money. And I started this in 2012, so there's not much momentum going on here, either. I have to admit my fondness for log cabin blocks is growing, even though what I've produced so far hasn't been much to write home about. It's time to look into doing something with log cabins that involves a little more effort and thought. But for now - quilt 25 is ready to sandwich - the backing is ready to go and it will be another good longarm practice project.